"In dancing she delights, and she dances in Valimar on lawns of never-fading green." 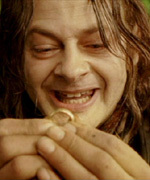 Andy Serkis provides the voice for Gollum/Smeagol, a pathetic and warped creature who seeks the One Ring for himself. Andy Serkis was born in Ruislip Manor, West London, England and has three sisters and a brother. His father, worked as a Doctor in Iraq and the family spent many years travelling around the Middle East. Andy spent the first 10 years of his life travelling backwards and forwards between Baghdad and London. As his mother was worked as a special education teacher of handicapped children, Andy and his four siblings were raised with au pairs. Andy’s desire was to be an artist being fond of painting and drawing, and saw himself working behind the scenes in productions. He attended St. Benedict’s School, a Roman Catholic School for boys at the Benedictine Abbey in London, moving on to study visual arts at Lancaster University, in the north-west of England. It was there that he became involved in the mechanical aspects of the theatre doing stage design and set building for theatrical productions. When asked to play a role in a student production, he made his stage debut in Barrie Keefe’s play ‘Gotcha’; following which he turned from stage design to acting, transforming his life. In 1985 Serkis began his professional acting career at the Duke’s Playhouse in Lancaster, earning his Equity card. He appeared in 14 plays as an apprentice of Jonathan Petherbridge. He then worked voluntarily for Touring Theatre Companies, fuelled by a sense of enthusiasm and moving to a new town every week. In 1989 he appeared in a stage production of Shakespeare’s ‘Macbeth’ and began his long association with the Royal Exchange Theatre, Manchester, returning many times to appear in many Plays, including ‘She Stoops to Conquer’, ‘Your Home in the West’ and the ‘True Nature of Love’. It was in the 1990s that Andy began to make his mark on the London stage, appearing at the Royal Court Theatre as the Fool in ‘King Lear’. He also appeared as Potts in the hit play ‘Mojo’, playing in front of full houses and earning huge critical success. In 1987, Andy made his debut on TV, acting in several major British TV miniseries throughout the 1990s. It was in 1999 that Andy landed the prize role of Gollum in ‘The Lord of the Rings’, spending four years on the part, receiving awards and nominations for his performance. Andy produced the voice of Gollum by copying the sound of his cats clearing fur balls out of their throats. Andy and his partner, actress and singer Lorraine Ashbourne, live in London and have a daughter, Ruby, and two sons, Sonny and Louis George. Andy is purported to use his ‘Gollum’ voice on his children, for fun and/or when they misbehave. Away from acting, Andy is an accomplished amateur painter. It was during his school years at Lancaster, and being so close to the Lake District, that Andy developed his other passion in life: mountaineering and he was thrilled to meet Sir Edmund Hillary, the first person to climb Mount Everest, during principal photography for Lord of the Rings in New Zealand.